Most new moms and dads race through their household in a chaotic, bleary-eyed fog, tripping over piles of laundry and trying to grab a shower the moment baby hands over the Holy Grail of parenting: the ever-elusive, long nap. 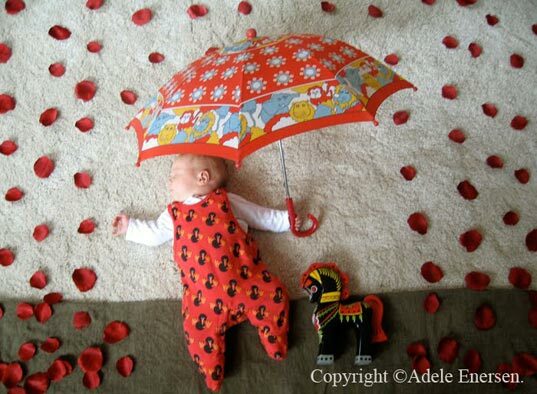 But one new mom, Adele Enersen is using her baby daughter’s slumber as an opportunity to create an homage to her sweet, new life by imagining her dreams and harnessing them in pictures. Mila’s Daydreams is a treasure trove of images that manages to elevate one of the most beautiful sights: a peacefully sleeping baby, to a captured moment of brilliant art. Adele fashions whimsical worlds around her daughter as she takes her daily nap, and her “maternity leave hobby” is taking the blogosphere and the media by storm with its simple charm and ingenuity. 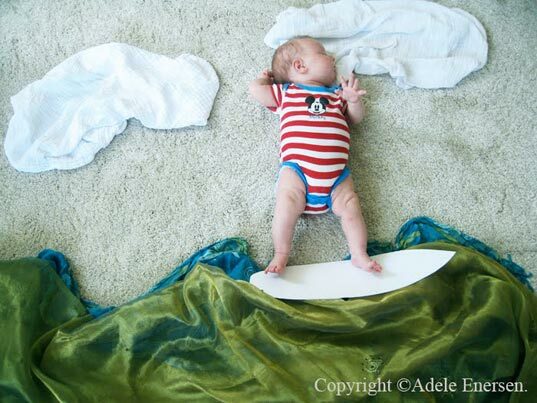 Regarding her process, Adele offers, “I use only a few minutes per picture, including creating the idea, implementation and editing, ’cause I don’t want to disturb her sleeping.” It looks as though many of the items Adele uses in her spontaneous shoots are simply garnered from around the house; and clothing is often reused and re-fashioned to take on different forms, including one brilliantly devised elephant. In the meantime, we’ll certainly love watching Mila’s Daydreams unfold. I think you are in the minority and I mean that very politely. I understand your opinion but I just see it as a beautiful interaction between mother and child where she is imagining all the lovely things her baby could dream about. The styling is done so well and the idea of the baby floating in her dreams really comes accross. When I see the photos I am filled with joy. A mother's words before a baby falls asleep are often a wish for "sweet dreams" and I see this as a mothers way of wanting a perfect world for her baby even when she is sleeping. absolutely beautiful but also fun at the same time. i loved looking at these. thank you. Most new moms and dads race through their household in a chaotic, bleary-eyed fog, tripping over piles of laundry and trying to grab a shower the moment baby hands over the Holy Grail of parenting: the ever-elusive, long nap. 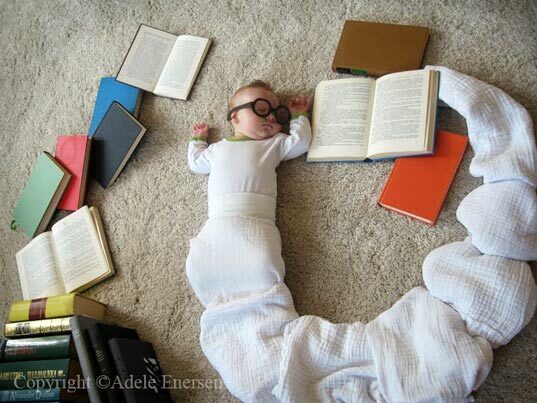 But one new mom, Adele Enersen is using her baby daughter's slumber as an opportunity to create an homage to her sweet, new life by imagining her dreams and harnessing them in pictures. Mila's Daydreams is a treasure trove of images that manages to elevate one of the most beautiful sights: a peacefully sleeping baby, to a captured moment of brilliant art. Adele fashions whimsical worlds around her daughter as she takes her daily nap, and her "maternity leave hobby" is taking the blogosphere and the media by storm with its simple charm and ingenuity.